UPS stands for Uninterruptible Power Supply. A UPS system is an autonomous source of alternate power that is used to supply sensitive electronic loads such as computer centers, telephone exchanges and many industrial-process control and monitoring systems. These applications require power that is availability and of good quality. 3. Stepping in to replace utility power with no transfer time, i.e. without any interruption in the supply of power to the load, through use of a static switch. These characteristics make UPS units the ideal power supply for all sensitive applications because they ensure power quality and availability, whatever the state of utility power. 2. Inverter, which produces quality electrical power free of all utility-power disturbances, notably micro-outages and that is within tolerances compatible with the requirements of sensitive electronic devices. In normal mode operation, the load is supplied by utility power via a filter which eliminates certain disturbances and provides some degree of voltage regulation (IEC 62040 specifies some form of power conditioning). The inverter operates in passive standby mode. In battery backup mode operation, when the AC input voltage is outside specified tolerances for the UPS or the utility power fails, the inverter and the battery step in to ensure a continuous supply of power to the load following a very short less than 10 ms transfer time. 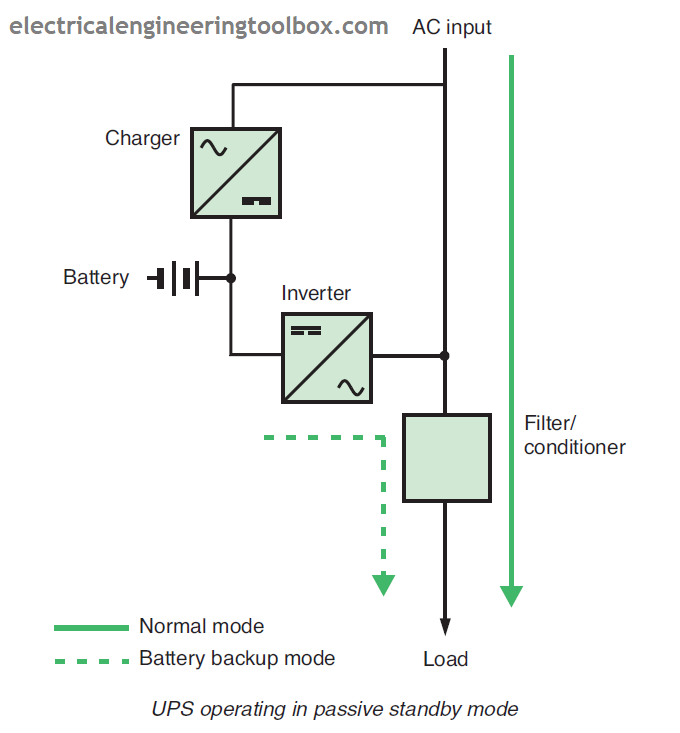 The UPS continues to operate on battery power until the end of battery backup time or the utility power returns to normal, which causes transfer of the load back to the AC input (normal mode). This configuration is a compromise between an acceptable level of protection against disturbances and cost. It can be used only with low power ratings less than 2 kVA. (large computer centers, telephone exchanges, etc.). Furthermore, the frequency is not regulated and there is no bypass. In normal mode operation, the load is supplied with conditioned power via a parallel connection of the AC input and the inverter. The inverter operates to provide output-voltage conditioning and/or charge the battery. The output frequency depends on the AC-input frequency. In this mode of operation, when the AC input voltage is outside specified tolerances for the UPS or the utility power fails, the inverter and the battery step in to ensure a continuous supply of power to the load following a transfer without interruption using a static switch which also disconnects the AC input to prevent power from the inverter from flowing upstream. The UPS continues to operate on battery power until the end of battery backup time or the utility power returns to normal, which provokes transfer of the load back to the AC input (normal mode). This type of UPS may be equipped with a bypass. 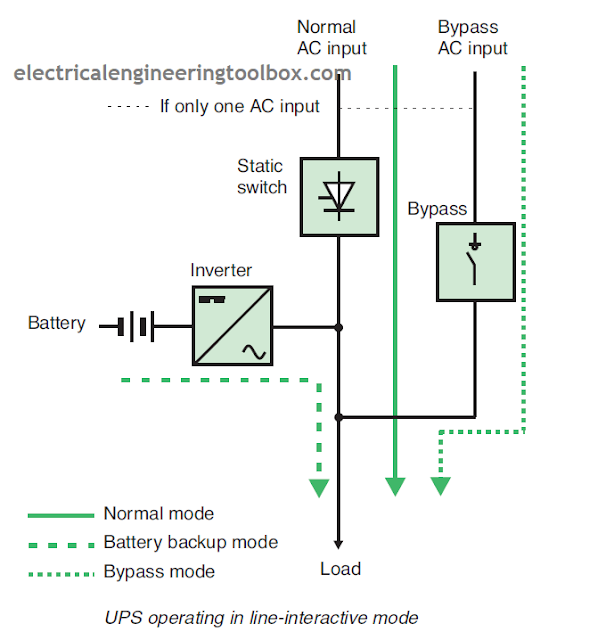 In the bypass mode, If one of the UPS functions fails, the load can be transferred to the bypass AC input (supplied with utility or standby power, depending on the installation). This UPS configuration is not well suited to regulation of sensitive loads in the medium to high-power range because frequency regulation is not possible. For this reason, it is rarely used other than for low power ratings. During normal operation, all the power supplied to the load passes through the rectifier/charger and inverter which together perform a double conversion (AC to DC to AC), hence the name. In battery backup mode, When the AC input voltage is outside specified tolerances for the UPS or the utility power fails, the inverter and the battery step in to ensure a continuous supply of power to the load following a transfer without interruption using a static switch. The UPS continues to operate on battery power until the end of battery backup time or utility power returns to normal, which causes transfer of the load back to the AC input (normal mode). 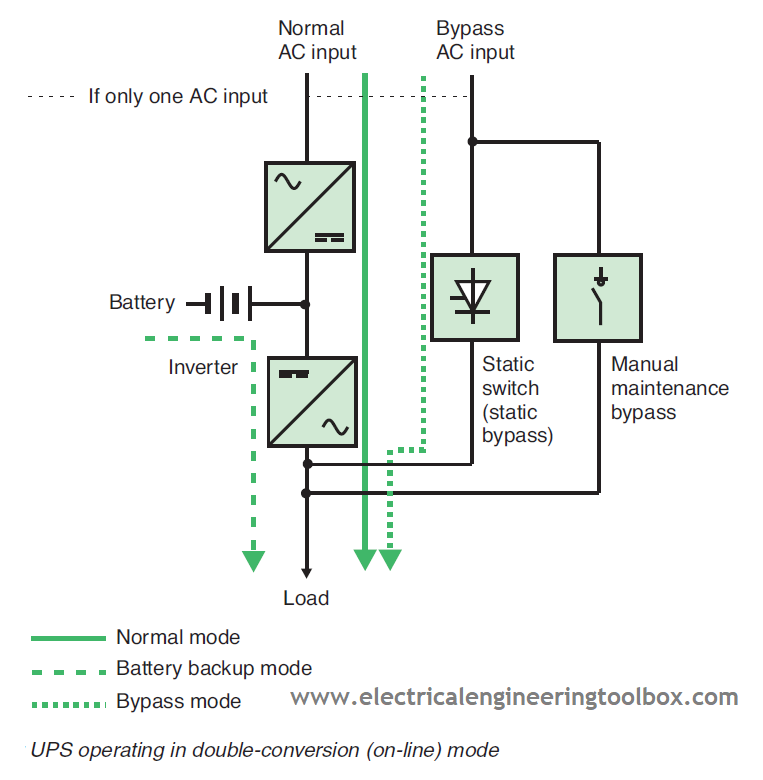 This type of UPS is generally equipped with a static bypass, sometimes referred to as a static switch. The load can be transferred without interruption to the bypass AC input (supplied with utility or standby power, depending on the installation), in the event of UPS failure, load current transient (inrush or fault currents) or load peaks. The presence of a bypass assumes that the input and output frequencies are identical and if the voltage levels are not the same, a bypass transformer is required. For certain types of load, the UPS must be synchronized with the bypass power to ensure load-supply continuity. Furthermore, when the UPS is in bypass mode, a disturbance on the AC input source may be transmitted directly to the load because the inverter no longer steps in. Another bypass line, often called the maintenance bypass, is available for maintenance purposes. It is closed by a manual switch.